We are pleased to offer rental of the Cafesjian Center for the Arts' facilities for business meetings, conferences, presentations, banquets and other special events. Artistic environment, beautiful setting, panoramic view of the city, location at a major landmark of Yerevan, the Cascade Complex - all this makes the Cafesjian Center for the Arts an unrivaled venue for any kind of event. KHANJYAN GALLERY. A large open space of about 250 sq.m. dominated by the monumental mural signifying Armenia’s past, present and future as visualized by Grigor Khanjyan. This space is perfect for corporate meetings, conferences, receptions and more, hosting up to 150 people. SASUNTSI DAVIT GALLERY. A large open space of about 250 sq.m. The Sasuntsi Davit relief was created by renowned Armenian sculptor Artashes Hovsepyan, showing more than thirty episodes from the famous Armenian epos. This space is perfect for corporate meetings, conferences, receptions and more, hosting up to 150 people. GARDEN TERRACES. Create a relaxing mood for your guests by holding your next event on one of the outdoor terraces at the Cafesjian Center for the Arts. Surrounded by fountains and beautifully landscaped flowerbeds, the terraces are an ideal venue for a small reception hosting up to 60 people. The magnificent views of the city and Mount Ararat will leave long-lasting memories of your special occasion, whether it is a private dinner, a small wedding or a party. SPECIAL EVENTS AUDITORIUM. Unparalleled ambiance of elegance. Located at the top level of the Cascade and seating 120 people, the Special Events Auditorium (SEA) offers a spectacular panorama of Yerevan and Mount Ararat beyond. Designed with an audiophile in mind, the SEA offers the city’s premier venue for concerts and other events. 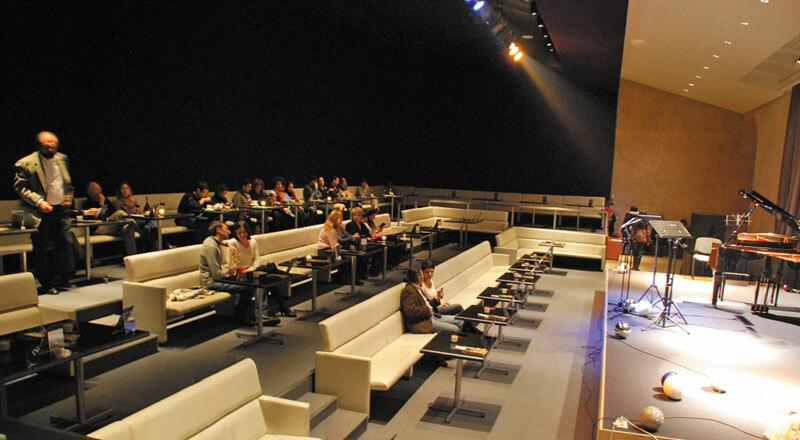 It is appointed with a full-service cocktail bar and is a perfect place for lectures, film festivals and corporate parties. THREE DIVERS’ TERRACE. The upper level of the Cafesjian Center for the Arts, overlooking the city of Yerevan, is known as Three Divers Terrace, because of the stunning sculpture by David Martin in its center. The reflecting pool around the steel Divers makes the landing particularly attractive for open-air receptions that can host up to 120 people. The terrace’s illumination will impart additional beauty to the events held after dark. STAR LANDING. The top inner landing of the Cafesjian Center for the Arts, into which the Swarovski Crystal Palace and the Special Events Auditorium open. Presenting beautiful modern art, enlivened by colorful lighting, the Star Landing is perfect for standing receptions.